Now you can get these two classics together on one CD – completely re-mastered, plus there are two previously unreleased bonus tracks of early 4 track demo stuff from before Warp Speed. 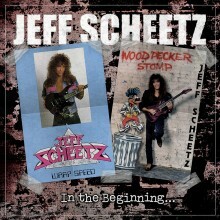 The re-release of Jeff's first two CDs together! Jeff originally recorded Warp Speed in 3 days as a demo of his guitar playing. It was later picked up by a label in Mexico and released there on CD. He then was offered a record deal to do Woodpecker Stomp which featured a couple of the Warp Speed tracks redone as well as the Title track Woodpecker Stomp which went on to become the first instrumental ever to break into the top 10 on the ccm rock charts! Woodpecker Stomp was also in heavy rotation on the nation’s number one rock station “Z-Rock”.